TVXQ! 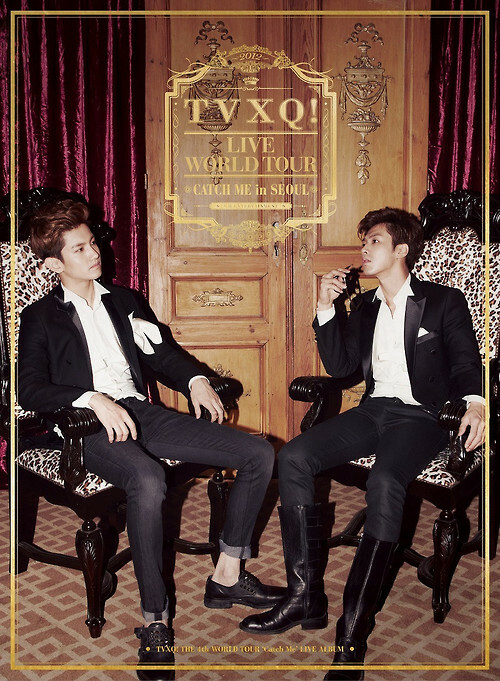 LIVE WORLD TOUR “Catch Me” was the fourth international and first worldwide concert tour of TVXQ!. The concert tour was set three years after the TVXQ! The 3rd Asia Tour Concert MIROTIC and also the first tour involving only the current TVXQ! duo, U-Know Yunho and Max Changmin, after the split-up. The tour visited Asia, North America and South America from late 2012 through mid-2013. The concert in Seoul was first announced on October 8, 2012, two weeks after the release of Catch Me album on September 26. TVXQ! performed songs from their latest Catch Me album, along with some of their biggest hits including “Rising Sun”, ““O”-正.反.合.”, “MIROTIC” and “왜? (Keep Your Head Down)”. They also included a ballad medley session and performed a total of four notable ballads from the albums in the years they debuted. The show lasted for about three and a half hours. Rehearsals took place on November 16 ‘til the dawn of November 17 in Seoul Olympic Park Gymnasium. TVXQ! rehearsed their choreography under the guidance of Beat Burger’s Shim Jae Won. In Los Angeles, TVXQ! was supported by six male backup dancers. TVXQ! performing “I’ll Be There” in Hong Kong. Photo: S.M. Entertainment. About 30 songs were performed in each show. Changmin performed one cover song in Mandarin for his solo which was A-Mei’s “Listen to the Sea” in Hong Kong, Beijing and Shanghai. In Los Angeles, he covered Maxwell’s “Whenever, Wherever, Whatever” instead. “Honey Funny Bunny” was performed by Yunho throughout the whole tour. The ballad medley “기억을 따라서(Everlasting)”, a Korean rendition of the Japanese “時ヲ止メテ(Toki wo Tomete)” written by Changmin, was removed in Beijing and after concerts in Kuala Lumpur. “B.U.T (BE-AU-TY)” was only performed in Japanese in the Seoul concert while the song was adapted into Korean for the remaining shows in the tour. TVXQ! performed “Humanoids” and “Here I Stand” for the first time in Seoul on November 17 before the official release of the Catch Me repackage album on the 26th of the same month. TVXQ! pre-recorded a number of videos for the concert. The introduction video started off with a rainfall on Earth and panned out showing the Sun was dying and began to lose its fire. A sorceress appeared and reignited the dead Sun. U-Know and Max were born from the flames before turning into comets to make their way to Earth as the video called out their names. The TVXQ! duo then emerged while the scene ended with a glowing backdrop of the concert’s official logo. The narrator concluded the intro with “TVXQ! LIVE WORLD TOUR in” and proceeded with the name of the city TVXQ! was holding that particular concert at. TVXQ! also pre-recorded several scenes with children, a showdown with ninjas and a dance performance for “Before U Go”. 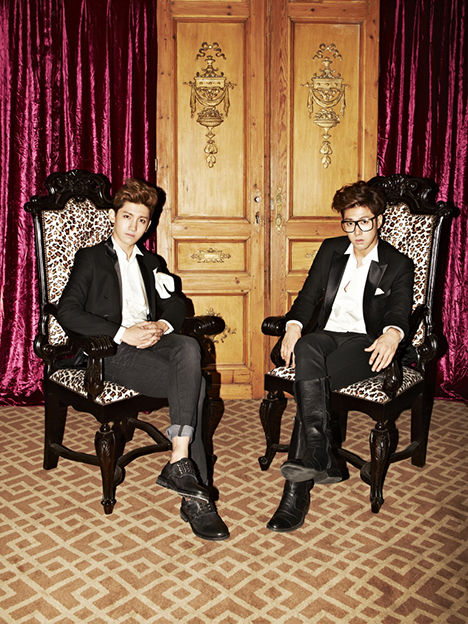 The duo re-recorded all the original releases of songs by the five members of TVXQ!. The re-recording was done to dub over the vocals of Junsu, Yoochun and Jaejoong. In “Wrong Number”, the lyrics for the rap, which originally sang by Jaejoong, were completely altered and Yunho did for both raps. The English rap in the beginning of “Hi Ya Ya” was also modified. It was originally performed by Yoochun, but Yunho sang his part in the concert. The choreography for “Wrong Number” was slightly improvised for the current duo. TVXQ!’s concert stage in Seoul. Photo: Oh Se Young. The stage setup for the Asian leg varied from the North and South American legs. 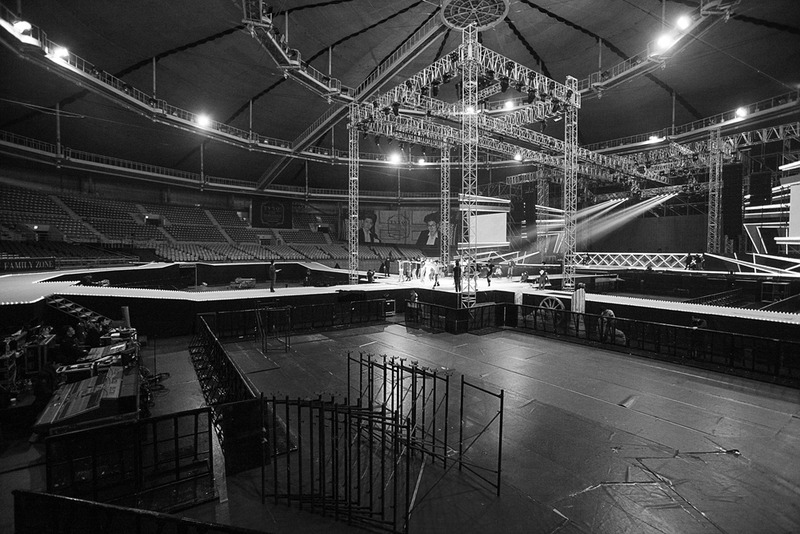 For Seoul, the main stage was extended into an arc-shaped platform consisting of one central “in the round” and one end stages. A high rise structure was erected in the central stage for lighting purposes. The concert in Kuala Lumpur was specially redesigned for fans to be much more closer to the stage. More than MYR1.5 million (approximate USD460,200) was invested in the development of the Kuala Lumpur show. The North and South American tours, however, were set up with just the main stage. 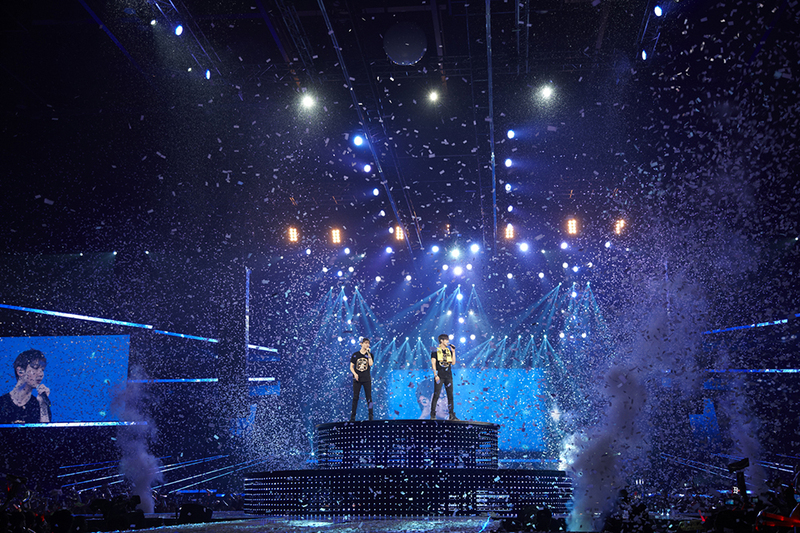 Cranes, lifts, LED moving graphics and lasers were used throughout the world tour. The duo for the first time in their career went into the crowd twice while performing “꿈(Dream)” and “Sky” in the Los Angeles visit. Billboard Korea initially reported that TVXQ! would be touring across Europe in England and France, Australia, Russia, Japan and the Philippines while Thailand was also officially announced being one of the confirmed cities among the world tour. These plans, however, did not take place, making Thailand not part of a concert tour in TVXQ!’s career for the first time. On November 25, 2012, SBS Inkigayo aired TVXQ!’s “Humanoids” performance from the concert in Seoul as part of that day’s episode. Additionally, on May 1, 2013, a special clip containing concert highlights from the Beijing concert was aired on Arirang TV under the Pops in Seoul music program. Concert highlights and footage from the two-day Seoul concert were recorded for a documentary, “Catch Me” Production Note. The documentary was then released in DVD one year later on December 19, 2013 and it also includes a photo booklet, where 10 pages are concert shots taken by photographer Oh Se Young. An official tour photo book was released on May 9, 2014 and it includes 148 pages of photos from concerts, rehearsals and backstage throughout the world tour of 8 shows in 7 cities. The photo book comes with 9 pieces of postcards in a special package box. TVXQ! 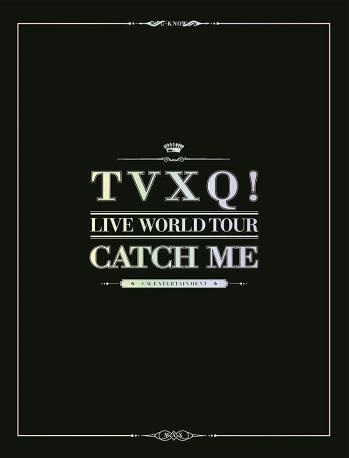 THE 4th WORLD TOUR “Catch Me” LIVE ALBUM was released on May 22, 2014 as a two-disc album and accompanied by a booklet of never before seen tour photos. 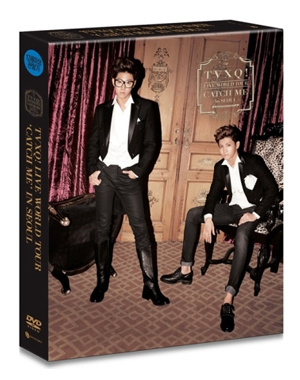 This album features 29 tracks recorded over two nights during the concert in Seoul on November 17 and 18, 2012. The Korean versions for “B.U.T (BE-AU-TY)” and “기억을 따라서(Everlasting)” are included as bonus tracks. On August 14, 2014, the Seoul show was filmed and released as a 2-disc live concert DVD, where disc 2 includes 15-minute footage of concert rehearsals, backstage and interview. 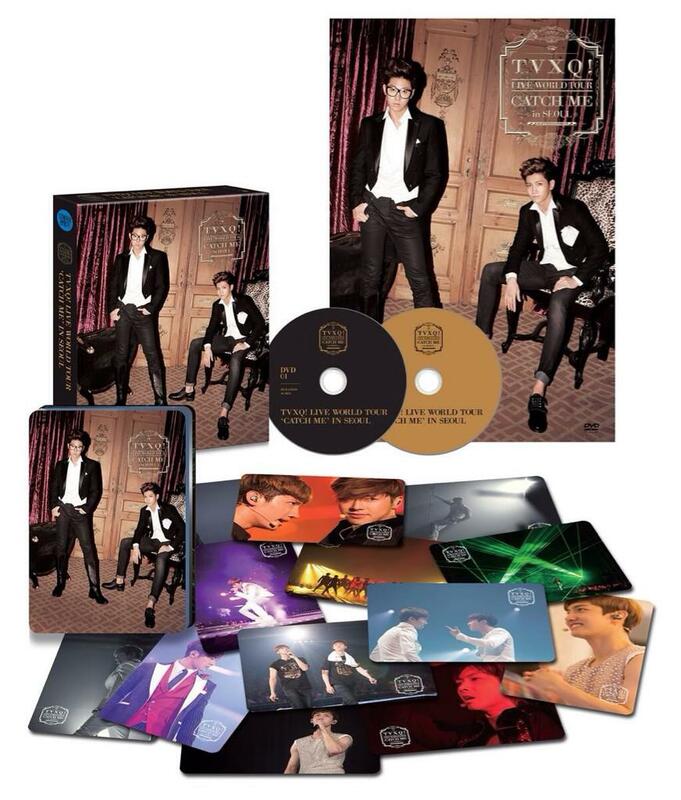 The DVD set came with special colored photo cards and an exclusive poster. An US edition was later released on August 19, 2014. The tickets for the two-day Seoul concert were sold out in just 3 minutes with 25,000 seats. On the first day of the tour, various artists attended the show including Super Junior’s Donghae, EXO-K, EXO-M and Brian Joo. TVXQ! was visited by labelmates BoA, Go Ara and f(x)’s Victoria and Amber on the following day. JPM Music, the organizer for the Kuala Lumpur tour, held a pre-sale ticket event on March 16, 2013 and over 1,500 fans came to show their support. KCON hosted a surprise flash mob event at Nokia Plaza in Los Angeles and over hundreds of participants took part and performed “Catch Me” prior to the concert. According to Hanteo, the concert’s live album physical sales entered the daily chart at number-two on May 23, 2014. The album was placed at number-three for week May 18 to May 24 as the best-selling album for physical sales on the Gaon Music Chart. ● Rising Sun (순수)_Rock Tronic Remix Ver. “고백(Confession)” was replaced with “聽海(Listen to the Sea)” for Changmin’s solo performance in Hong Kong, Beijing and Shanghai. “고백(Confession)” was replaced with “Whenever, Wherever, Whatever” for Changmin’s solo performance in Los Angeles. Photo interactive session was only carried out in Seoul. “기억을 따라서(Everlasting)” was removed from the set list in Beijing, Los Angeles, Santiago and Shanghai. The Japanese version of “B.U.T (BE-AU-TY)” was adapted into Korean for shows after Seoul. “Summer Dream + Sky” was removed from the set list in Shanghai. “Summer Dream + Sky” was interchanged with “Hi Ya Ya 여름날_Rearranged” in Hong Kong, Beijing and Kuala Lumpur. “Hi Ya Ya 여름날_Rearranged” was removed from the set list in Los Angeles and Santiago. 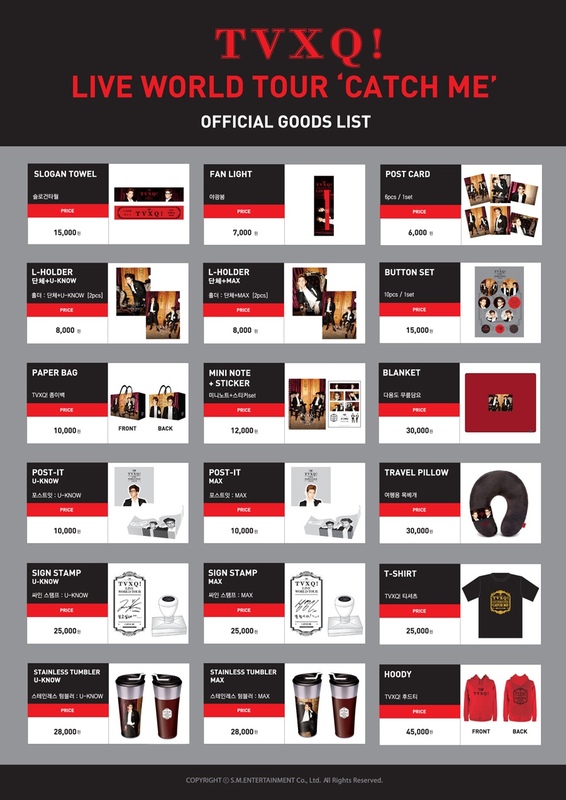 The list of goods was revealed a day ahead of the Seoul concert through TVXQ!’s official website. The sales of the merchandise on the first day concert in Seoul began at 11:00AM and ended at 6:00PM Korean local time. The next day, the sales took place earlier at 10:00AM till 3:00PM. Fans were given order forms while queuing in both days to make their purchases. All merchandise were showcased and contained in a large display box outside the stadium. The list of goods for the Seoul tour were not fully available for shows in the overseas and some merchandise were removed depending on the demand of each country visited. With the combination of casual and formal pieces, we could see the more stylish side of TVXQ!. 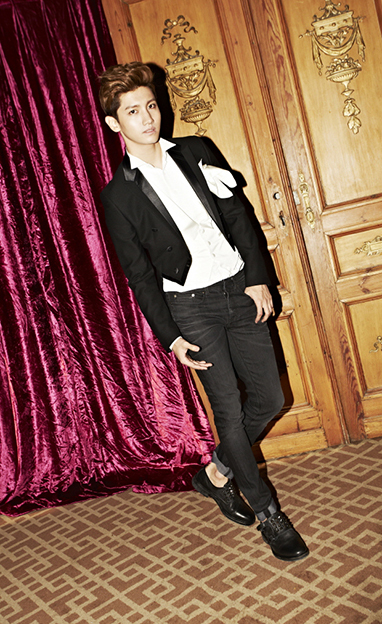 The black suits with different unique cuts and applications, balanced with the plain white shirts, paired with leather shoes make the outfits look artsy yet very manly. Pulling off the classics with a touch of modernism brings out a new feel of simplicity in contrast with the elegance of the room. The posters are quite in contrary to the original album concept, but nevertheless with TVXQ!’s charm, the fusion of the past and present comes out really appealing and charismatic. This page was last modified on January 10, 2015.